Home » Fashion » Bags » Grab a Satchel and lets get back to school! 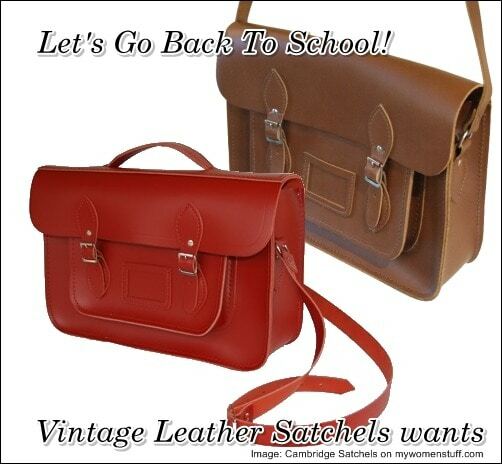 Grab a Satchel and lets get back to school! Last weekend I was chatting online to LeGeeque when I mentioned that I was in the market for a messenger bag. Immediately I was introduced to the idea of a satchel and I am now lusting after one. Not just any satchel. I want a leather satchel with a strap that I can sling cross body like a messenger bag. I want something that looks like I stepped out of 1950’s Enid Blyton adventure books. 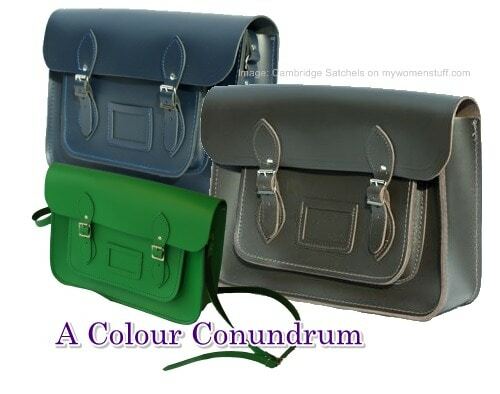 I’m not about to go back to school but when LeGeeque directed me to The Cambridge Satchel Company , I fell in lust with the leather satchels on offer. This is just what the doctor ordered – a perfect vintage preppy look. 13″ Perfect for children under 8 years old who don’t need to carry a school bookbag within their satchel. Also for a slightly bigger adult bag. 13″ along top, 9″ height, 3″ depth. 14″ This will hold A4 sheets. The perfect choice for children aged 7 and up that need to accommodate a school bookbag within their school bag. This is a very versatile satchel and will suit most purposes. I was contemplating either a 13″ or a 14″ which would put me in the same age category of either under 8 or 7 and up. Hmm… suits me fine! 😛 But after whipping out the tape measure I’m thinking perhaps the 11″ might be more suited for my frame especially if I’m looking for something I can carry on weekends and holidays but it looks a bit thin. The red bag I’ve pictured above is what The Cambridge Satchel Company calls a “batchel” – a satchel with a handle. Might be a little more adult eh? Like a briefcase but not. In red leather, it is serious… but not. Ah! The confusion I can just see in the eyes of the people who see me carrying it! Makes me want it even more. You can even get it embossed with your name or initials. I probably won’t if I get one, because I personally think it spoils the look a little and I don’t like having my name all over. I wouldn’t mind it on the side maybe. Based on the picture at the site, the interior is just one large compartment inside as with most satchels – its made for carrying books after all. Apparently the bigger sizes e.g. 14″ and 15″ can easily fit a laptop or netbook. Personally I carry enough around to do my back serious injury without carrying a laptop so that isn’t quite relevant for me. I have a question mark about how heavy it is empty. After all, its full leather and full leather bags can weigh a ton. That said, newer leather bags tend to be lighter so I can’t quite say. I have passed up numerous gorgeous bags because they weigh a lot when empty and my poor shoulders can’t take more abuse. So to end my gushing, I can tell you that The Cambridge Satchel Company ships internationally (GBP20 for 1 bag to Asia – ouch!) and the price of the bags range from GBP66 – GBP85 depending on size and design. Not all that expensive really. So I’m dithering between the 11″ or 13″ Red or Vintage Brown or even the Green maybe? Or Perhaps the Red Batchel? Any thoughts? PREVIOUS POST: April Showers Brings May Flowers – Care tips for African Violets? The bag brought me back down to memory lane, that is so cute! I haven’t tried any of these bags but it looks comfortable! I know! Cute is the operative word. Sigh… I really need to see these in person before deciding. ahhh… It looks so pretty~~ but if u plan on carrying heavy stuff, u shudn’t use messenger bags cuz it’ll be bad for your back, shoulders, etc which is y students shud use backpacks eventhough they aren’t very fashionable… hehe… I remember my schol bag used to weigh a ton! I was telling LeGeeque how similar these are to the red school bags in Japan. Very old school, very Enid Blyton. LOVE it! I love messenger bags and these look adorable. However, my ideal messenger is light and has a softer look. These look a bit on the stiff side and my concern is that it can be heavy. Before you decide, maybe you should email them and check on the weight of these bags. My favourites out of these are red, purple and yellow! I absolutely love satchels! Mom just bought me the most perfect one, with lots of compartments, in brown leather. Usually for satchels I have a thing for brown leather as it ages so nicely and looks better as it grows older. More picturesque and adventurish anyway. But those satchels in red and blue do look tempting! Argh! I’ll post it on Frocking sometime. It’s not like the cambridge satchels, it’s more the size of an upright netbook with a plain overflap and lots of pocketses. Great size for travel. I just pinned a dragonfly on it (its ok I plan to make full use of the two tiny holes I poked) so it looks less blank! These are COMPLETELY lightweight and don’t weigh anything. If weight is your concern, you’ve nothing to worry about. BUT, it is a little stiff. That’s awesome! I’ll wait till yours arrives then decide hehe… how lightweight is lightweight? Looks yummy but i reckon it’s gonna be bit heavy as it’s Leather… plus it’ll be bit inconvenient to unhook the 2 buckle every time you open it (like LV Saumur) unless it comes with those magnetic flap…. other than that, very English Prep look!!! That certainly is a thought – can I handle the inconvenience? Hmm… I read some people online who bought it making this comment too. I like the green one! How much is it after conversion? I’m in love with the Red…vintage brown looks reli classy too..
Wow! I wished I had found this company when I was in primary-middle-high school! I was dreaming for a bag like this. I must get one. Actually, this type of bag is in style right now, along with the saddle bag. 😀 Thanks for this post, Paris! I love your bag posts. Don’t I wish I was preppier in school too! 😉 Thanks innerchild. I’m glad someone enjoys reading about bags too! hey, im just thinking about buying the 11” red one. does anyone know how big is it? will it be too small to put in anything? and is the bag heavy?